What did the revolution do for Yiddish? 23 December 2017: Barry Davis, a dear friend of many people in and beyond the Jewish Socialists' Group, died on 14th December 2017. He loved Yiddish language and culture, and shared his knowledge and talent generously. 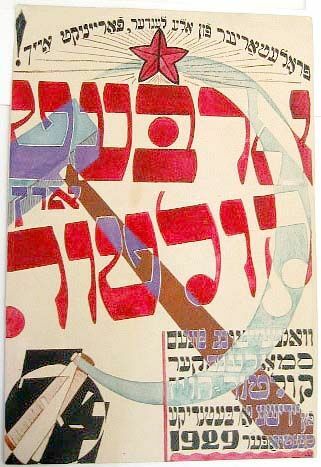 He wrote this wonderful article for the current issue of Jewish Socialist, in which he examines the new opportunities and the competing pressures surrounding Yiddish in the early years of the Soviet state. 4 April 2016: (publication date) This event is on 22 April 2016, 7 - 9.30pm. Details in the events section. 22 March 2015: The Marx Memorial Library on Clerkenwell Green was packed for the launch of Dave Rosenberg's new book 'Rebel Footprints'. Alex Gordon reminded us that the room we were meeting in once housed the printing press from which came many left-wing publications. And that reminded Charlie Pottins of how a ladies' tailor from Lithuania came to be linked with the building, when Lenin was working there. It was just part of OSIP PIATNITSKY'S adventurous life. A lfe which ended tragically, but should not be forgotten..
1 February 2015: This year marks the 100th anniversary of the deportation and mass murder of Armenians in Turkey. The word genocide had not yet been coined, but the word Holocaust in its modern sense was first used of what the Armenian people went through. It was not the first such crime against humanity, and as we know,not the last. But Armenians are still waiting for acknowledgement. 1 January 2015: 'En Hommage a Pierre Ghenassia', commemorating a young Jewish communist who died in Algeria's struggle for independence, was first published in the Algerian daily 'El Watan' in 2008. The writer, Mohammed Rebah, quotes a veteran liberation fighter who paying tribute to Ghenassia, said he wanted to answer those who claimed there was an inevitable antagonism between those of different religious origins. 7 December 2014: In January 1940, Leslie Hore Belisha, Britain's Secretary of State for War, was forced to resign because of what Prime Minister Neville Chamberlain called "a strong prejudice" against him. Belisha, the only Jew in the government, had been attacked by a notoriously right-wing magazine called "Truth". But he may well have sensed that behind this attack was a conspiracy hatched within the very government he served. In this article, first published in Jewish Socialist in Spring 1990, Charlie Pottins traces the connecting threads, and shines a light down some of the darker corridors of power in Britain. 5 December 2014: On November 8, 1942, as Allied forces prepared their landing in north-west Africa, in Operation Torch, some 400 ill-armed rebels seized strategic buildings in Algiers, with the aim of paralysing Vichy resistance and opening the way for the Allies. The prizes they captured that night included Admiral Darlan, no.2 in the Vichy regime. More than half the rebels were Algerian Jews. Coming almost six months before the Warsaw ghetto revolt, their action can be considered the first major act of Jewish armed resistance in the War, and perhaps the most successful. Yet their contribution to Allied victory, and how they were treated, are missing from many histories. 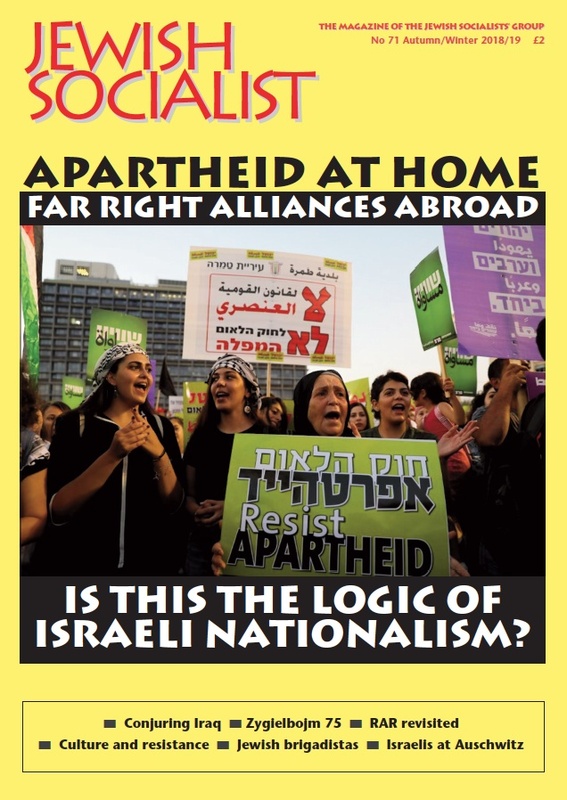 In this article, first published in Jewish Socialist in Winter 2012-3, Charlie Pottins looks at the background and events of the revolt. 5 December 2014: Egyptian Jew Henri Curiel was a founder of the Communist Party in his country and neighbouring Sudan, and a pioneer of genuine Israeli-Palestinian peace contacts when this was an illegal, risky, and many thought impossible mission. Respected also for his solidarity work for struggles in several countries, Curiel was under surveillance by more than one security service when he was murdered in Paris in 1978. 23 September 2014: VETERAN Bundist and Jewish Socialists' Group member Majer Bogdanski died in September 2005 at the age of 93. Born in the Polish industrial city of Lodz, Majer became aware of workers' struggles and Jewish resistance to oppression at an early age, joining the youth movement of the Bund. During the Second World War he survived the Soviet gulag and fought in Italy, while his fiance and family back in Poland perished in the Holocaust. After the war, settling in London's East End, earning his living as a tailor, and joining the Labour Party, and later the JSG. He also became a stalwart of Yiddish music and culture, which the Nazis and Stalin had done so much to destroy. At a memorial meeting for Majer in November 2005 there were tributes from at home and abroad. From New York University, Dr Gail Malmgreen wrote: 'Majer was a delightful person and an inspiration to many. He kept the dream of a better and more beautiful world alive in the worst of times.' . We are posting some of the tributes to Majer Bogdanski from that meeting, which were previously published in Jewish Socialist magazine. 20 September 2014: In December 1941, when the German armies were just a short distance from Moscow,. Henryk Erlich and Victor Alter, two leaders of the Jewish Socialist Bund in Poland, were shot in Soviet Russia. On the 50th anniversary of their deaths, JSG member Majer Bogdanski, himself a veteran of the Bund, wrote about their lives. 11 September 2014: Displayed above the bar in the West London Trade Union Club are a selection of decorative china plates commemorating the Tolpuddle Martyrs, the Spanish Civil War, the Miners' strike, and other proud episodes of working class history. They are the work of East End-born Lou Kenton, a club member who died two years ago, on September 17, 2012, aged 104. As Karl Lewkowicz narrates, Lou led a life as brave and colourful as his artwork. 19 August 2014: In June 1903, James Connolly took on the English Social Democratic Federation(SDF) leader H.M.Hyndman, in defence of the Socialist Labour Party in the United States,and its best-known leader Daniel De Leon. De Leon, who came from a Dutch Sefardi family in Curacao, was a founder of the militant Industrial Workers of the World, though he came to have differences with some of its leaders. Connolly himself had differed with De Leon on several issues, but in defending De Leon and the SLP against Hyndman, he felt it important first of all to denounce the SDF leader's chauvinism and antisemitism, before going on to compare the two parties. 19 August 2014: The Irish socialist James Connolly, executed by the British for his part in leading the 1916 Easter Rising, is revered as a patriot, but he was never a chauvinist. Among the lesser-known episodes of Connolly's life is the time he stood for election in Dublin in 1902, and made a bid for the immigrant vote with a leaflet in Yiddish. 31 July 2014: In war, it has been said, truth is the first casualty. Unfortunately not the last. The internet and social media have lessened our dependence on official channels and corporate media, but new methods of communication also ennable new trickery and disinformation. Let the reader beware. Identities and messages are not always what they seem. 26 July 2014: Maxim Ghilan came through the fire and storms of 20th century war to work tirelessly for a just peace. 20 July 2014: Amazing the friends you meet when you share a hatred. Captured on camera in Croydon in July 2013 when they joined a march against "terrorists" and Muslims. We don't know the name of the young man in the Kahanist tee shirt. But the older man with him is Holocaust denier Richard Edmonds. Never again? He said it never happened the first time. 20 July 2014: America's well-known Jewish "anti-defamation" body was caught using moonlighting cops in a murky spying operation that had little to do with protecting Jews and even targeted some of them. We don't know what lessons were learned from this episode by the ADL, or by some of its opponents. 8 July 2014: At Pesakh, the Passover, it is traditional to read from a special book, the Haggadah, about the liberation of the slaves from Egypt. Each of us is commended to think as though we personally were among those liberated. Over the centuries there have been several Haggadot which gave the story contemporary meaning. But a JSG member who went to Bosnia during the war there heard about one particular centuries-old Haggadah whose adventures have become a legend of its own. 6 July 2014: Not long ago a JSG meeting heard from Bangladeshi garment workers' union delegates, touring to raise awareness among trades unionists and consumers. Like the East End sweatshops of yesteryear, Asian garment factories supply the West End stores. But exploitation is not all that links our histories. Each new factory disaster in which workers are killed reminds us of what befell jewish and other immigrant workers in New York, one day in 1911.